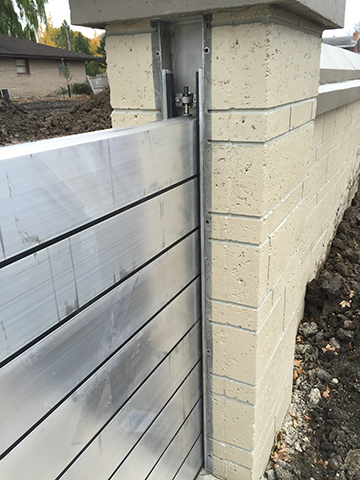 Rapidly deployable aluminum stop logs from TK (Thyssenkrupp-Bautechnik) supplied by Prairie Supply inc and installed by Reiner Contracting are put to the test in Fargo ND. The system was erected in under 20 minutes, proving its effectiveness during a flood emergency. This floodwall is just south of the El Zagal golf course on Elm Street in Fargo. The project was constructed by Reiner contracting out of Hutchinson, MN for the Fargo Diversion authority. The 64’ wide road closure has 7 center posts and is 8 stop-logs tall or about 6 ft. These pictures are from the test assembly done by the contractor for the city employees and the engineers. 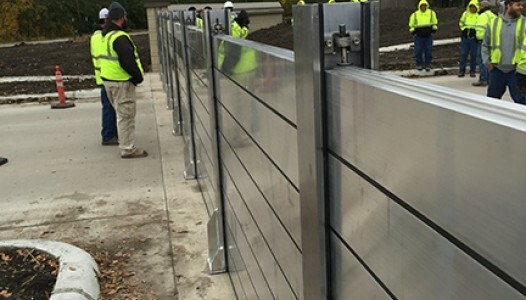 Once the main flood wall was completed and the framework for the removable portion installed, the road closure section can be installed and removed in less than 15 minutes. This flood fighting technology eliminates the need for sand bagging, dike construction and other labor intensive and slow to assemble temporary flood fighting solutions. 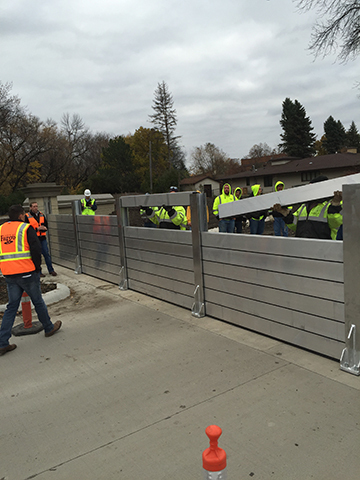 City of Fargo Employees and Contractor’s with Reiner assemble the deployable stop logs for the road closure section of El Zagal Floodwall in less than 20 minutes. This flood fighting solution is quick, relyable and much more aesthetically pleasing for any park or cityscape than dirt dikes and sand bags. The Stop Log system does not require any heavy equipment or complicated tooling. It is quick and simple to assemble, ideal for emergency situations.